We arrived back in Veurne, after an uneventful, but long journey back from Melbourne. About 26 hours flight time and a couple of hours in the train from Brussels. It had simply poured down when we left her last September and dragged our heavy bags the 1.5 km or so from the marina to the train station. As we stepped down from the train, we were greeted with a brief but fierce rain storm. Our first sight of Catharina Elisabeth was, of course, wonderful. She was a little tired looking, some little puddles of water here and there and a goodly supply of fallen leaves from the trees that had sheltered her while we were away. Getting ready to get back on board. We set about de-winterising, which consisted mostly of just turning on the water. Ian took the easy way out and gave our engineer friend, Willem, a call and he suggested looking for a fuse that might have been removed. Sure enough, there was the fuse taped to the wiring where Ian must have placed it last season. Silly. OK water going. The diesel heater for the hot water and room heating refused to stay alight. Fired for a few seconds then shut down. Repeatedly. Another call to Willem. His advice didn’t get it started. Park that one, other jobs were pressing. It was early afternoon, the weather had cleared, and so we got stuck into giving her a little tidy up. While Ian pumped up water from the canal and swabbed her down, Lisette dusted and vacuumed inside, unpacking and putting away our things. With no fresh supplies yet on board, we had a sip of black tea and kept at it until we felt she was in somewhat better shape. Then it was time to get the bikes off and set out to the supermarket for some groceries. Back on board, Ian opted for a cold shower. But the last of our on-board water drained away at that point and we realized we had done a fantastic job of emptying her water tank at the end of last season. The following morning we took a hot shower at the marina. 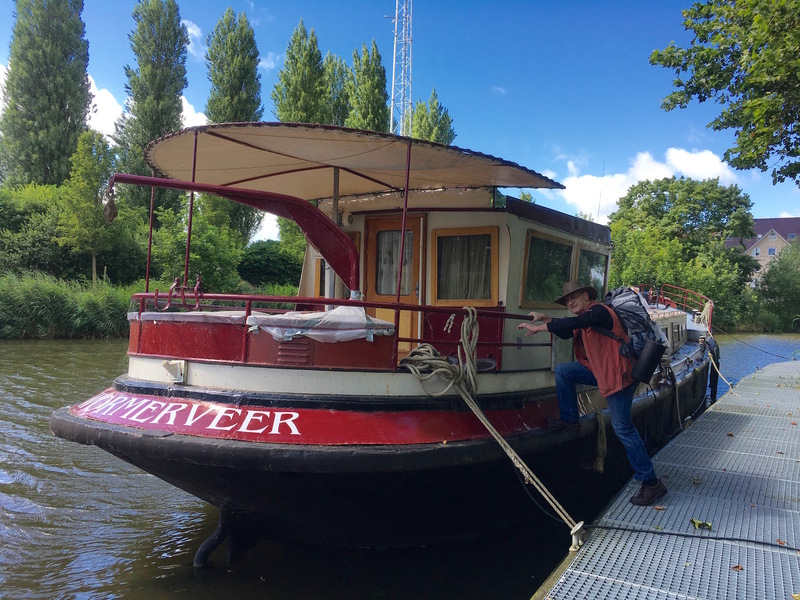 Around lunchtime, we went around to fill her up with water – and so our first cruise of the season was to reverse Catharina up and around the bend in the canal to the water point. 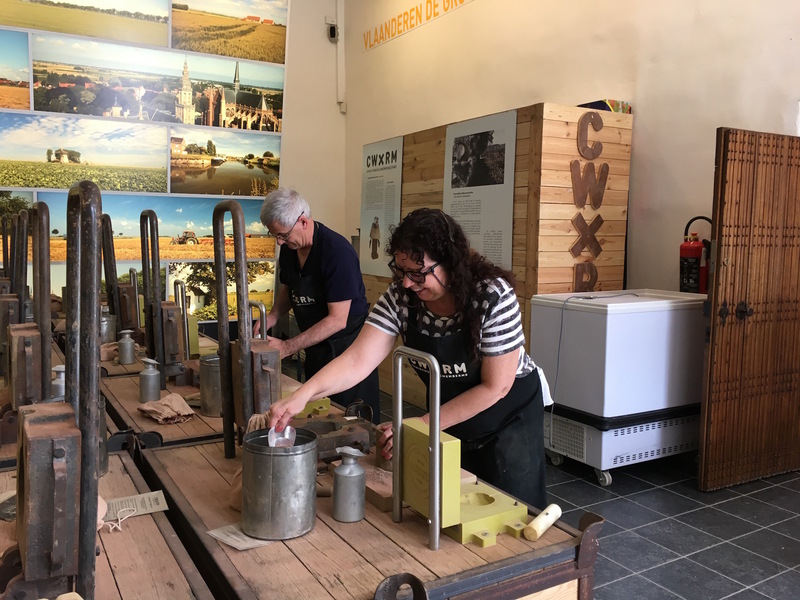 As the card system meant that water was delivered in 200 litre blocks, we were able to accurately calibrate the sight glass that Willem had installed last winter so we could see how much water was in the tank. This is a simple glass tube, connected to the tank, on the wall nearby. We knew the maximum, and had been making some estimates of usage, but now we have a robust and convenient measure of our 2000 L tank. The recalibrate, accurate water level device. 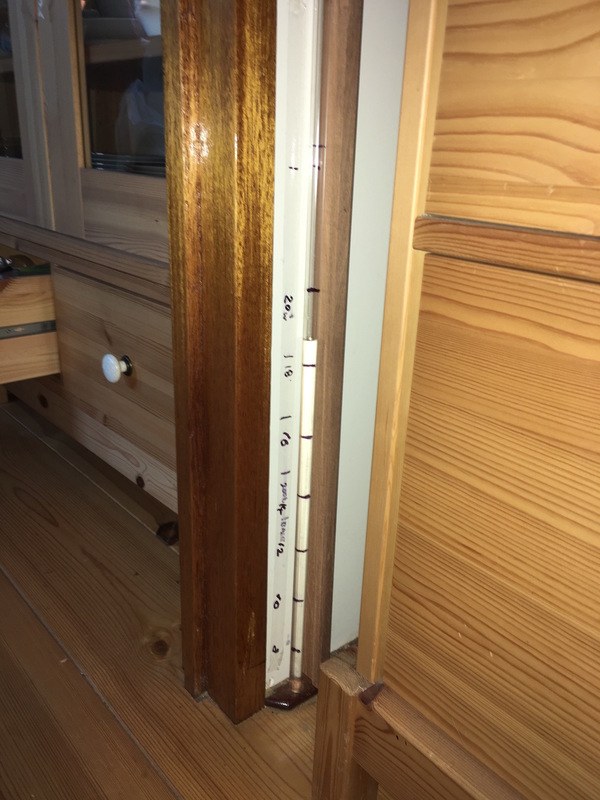 Beautiful woodwork – and the markings will be made more classy. It was warm and still – perfect weather to be out on deck doing chores, so we tidied up over the four hours or so that it took to fill the tanks (it took about 20 min for each 200 L). After this we again cruised Catharina backwards as we reversed back down the canal so we would be facing the way we wanted to leave next week. So now we had water, but still no heat. While we were watering, a pretty English barge Unique came in and moored. We soon caught up with the lovely English/German couple, Tony and Heidi, who are living aboard. During drinks on our aft deck that evening, Tony offered to help look at the hot water system the following day. Tony’s credentials were nearly 30 years in the armed services as an engineer – a hot water system was a trivial challenge for him. The next morning, we took advantage of another perfect day, and cycled into town for a few hours off. 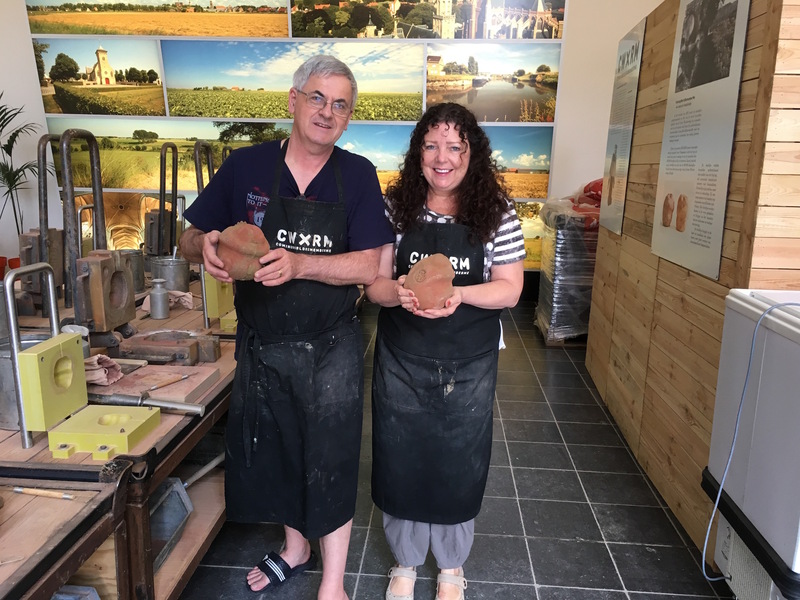 Between 2014 and 2018 thousands of people across Flanders and the rest of the world are taking part in workshops making clay sculptures. Lisette had heard about this and was desperately keen to contribute. We found a room in the Stadhuis (town hall) where we could make our clay models. 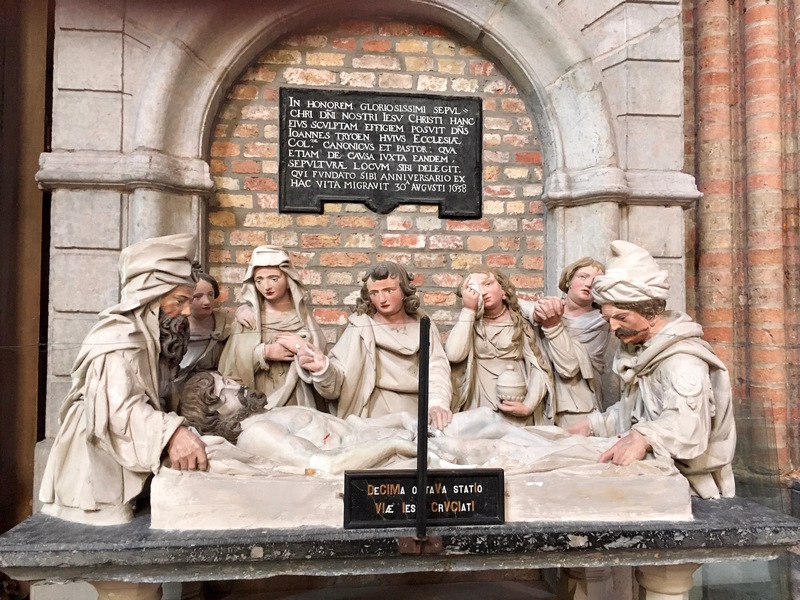 Every sculpture is made in the same way, with larger moulds for adults and smaller ones for children. The finished design represents a man sitting down with his arms around his knees, head bowed. 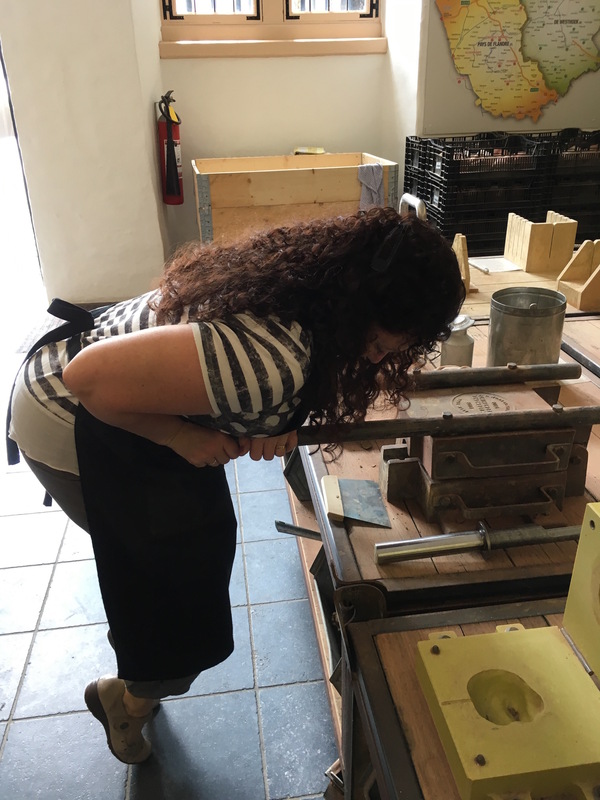 We started with a lump of clay, weighing about a kilogram, and dressed in a themed black apron, we took up a spot with a bunch of presses and other equipment. We had the place to ourselves, but saw others taking part when we walked by again later. 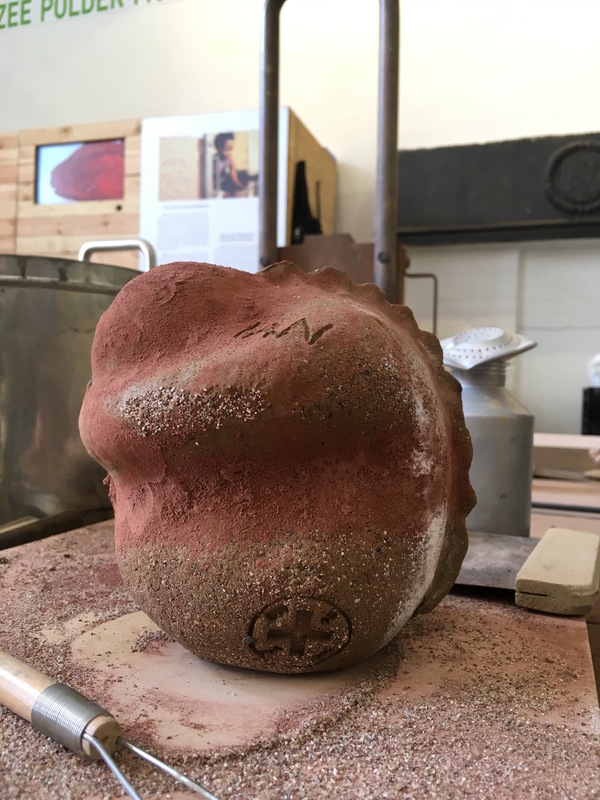 Having worked the clay by rolling and pressing in some gritty sand and salt into a somewhat malleable piece, we then placed it in a mould, pressing down hard until the clay was forced to fill the mould. Both of us had to hang our whole body weight from the mould to exert sufficient pressure, but it was all great fun. You really had to put in some hard work to make the figurines. Each figurine is marked by pressing a stamp disc into your model, which carries the CWRM symbol. We were then encouraged to decorate it any way we wished. 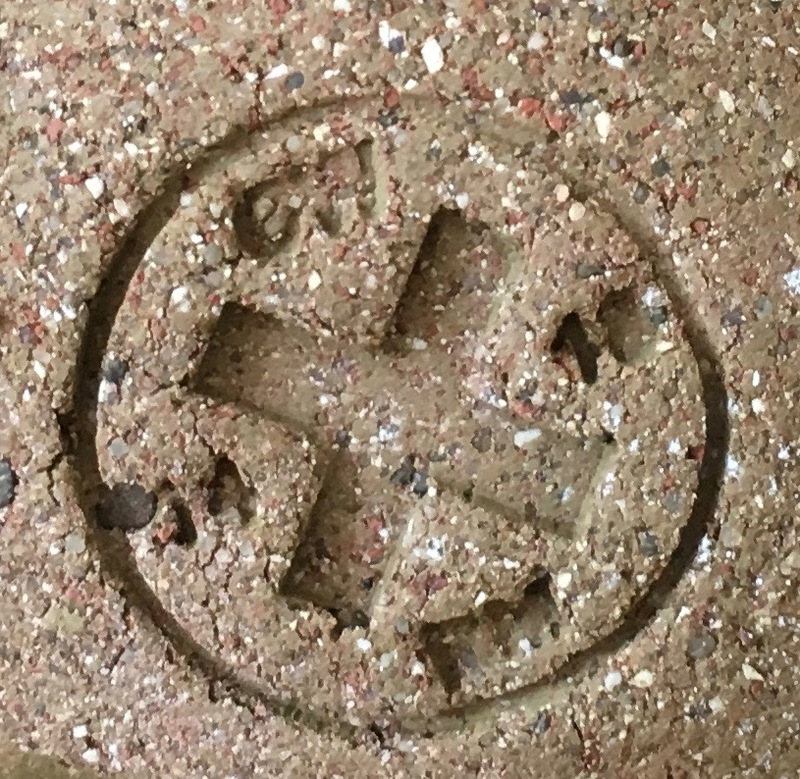 The symbol each figurine bears 19 14 and CW RM around the cross. You could modify the basic figurine with colour, engravings and even a row of spines. Later the models will be baked, and saved until 2018. The aim is to make 600,000 sculptures, representing the victims who lost their lives due to the First World War in Belgium. when each will have a dog tag placed around its neck, inscribed with the name of one of the fallen from ‘The Name List’ created by the In Flanders’ Fields Museum. On that same dog tag will be printed the name of one of those who had made a model. Linking everyone together. We received a similar dog tag with our certificates of participation. So on the centenary of the end of the war, the sculptures will be placed en masse in the land installation on one of the most hard-won places of WWI: the no man’s land of the frontline around Ypres. It was very moving, and a real privilege to be part of this enormous effort. Our tiny contribution to the memorial for the fallen soldiers in Flanders. 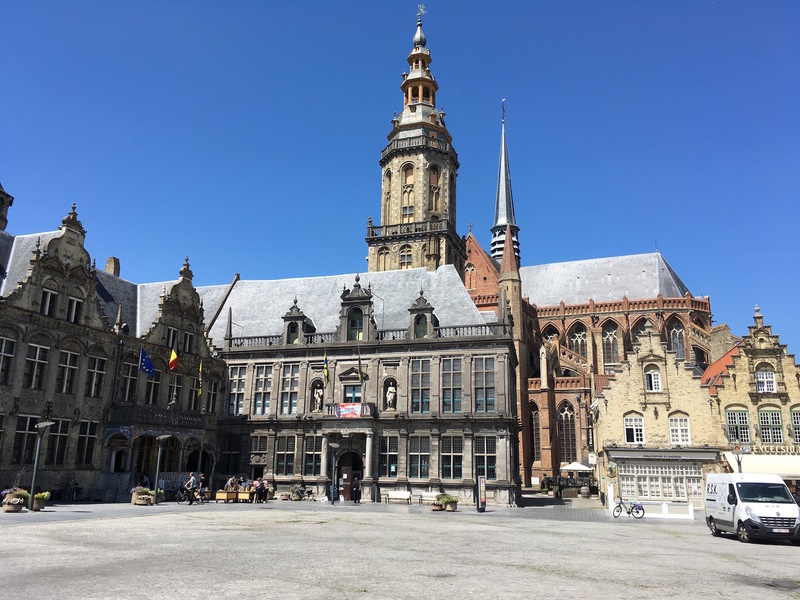 Next we took a wander through Het Stadhuis where we met the artist who had put together the impressive Vrij Vaderland exhibition which we had seen last year, also in Veurne. 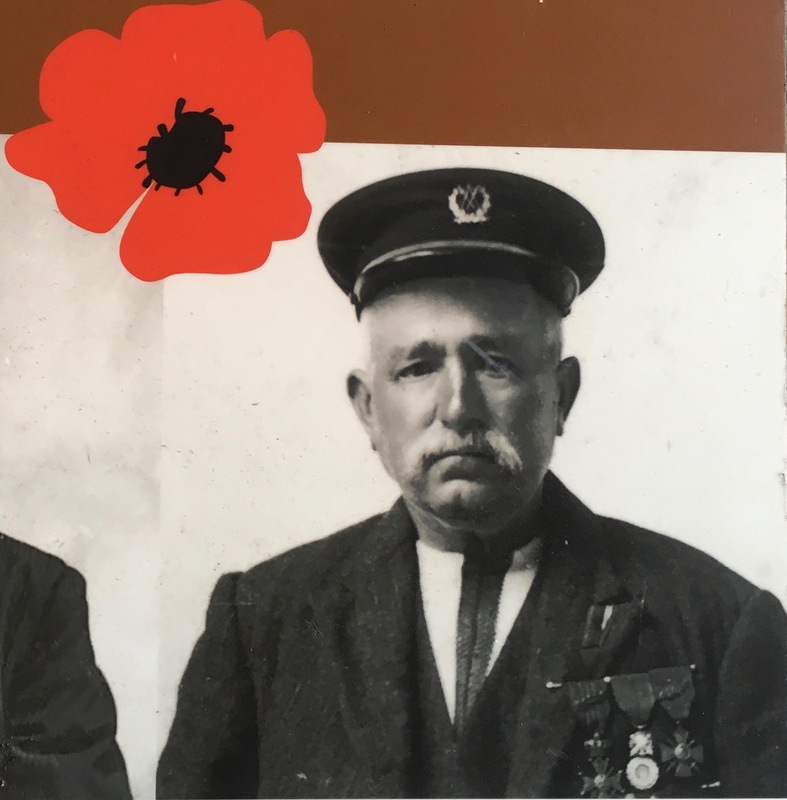 Also featured in the exhibitions was information on Hendrik Geeraert the bargeman who organised the flooding of the area north and east of Veurne that stopped the advance of the Germans in September 1914 and preserved the small corner of Belgium centred here in Allied hands for the rest of the war. He was widely celebrated after the war, becoming the feature on one of the large denomination Belgian banknotes. Hendrik Geeraert – the inspiration behind the flooding of Flanders’ Fields. There was just time for a quick visit to the Saint Walburga church, a beautiful edifice build in the Gothic style with parts dating from the 12th Century. 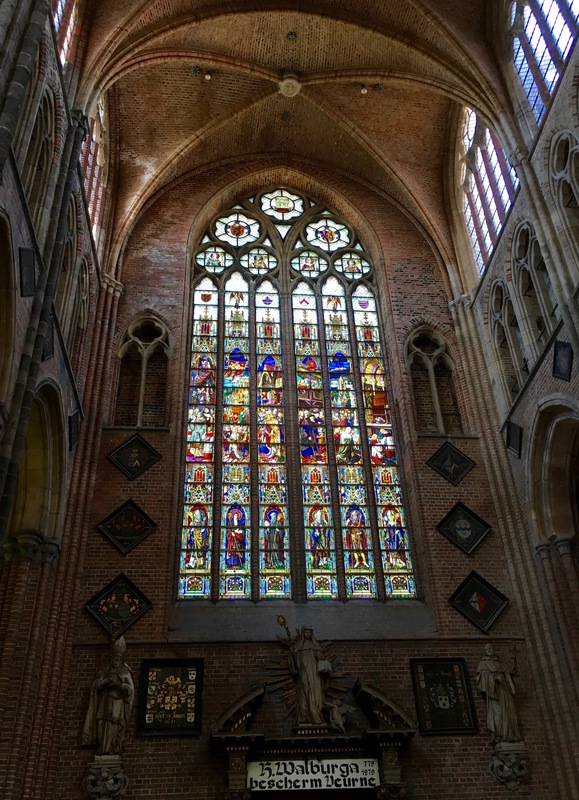 It features wonderful stained glass windows and a large organ – all very impressive. 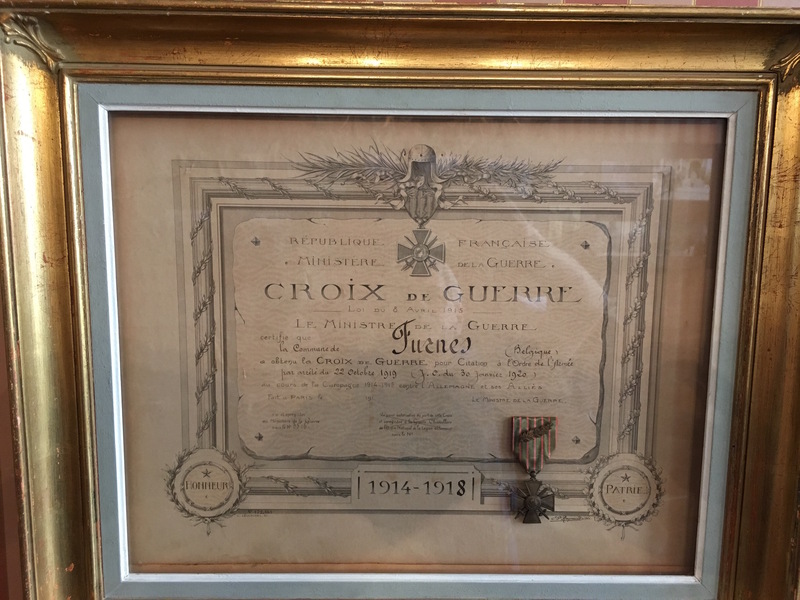 A relic from the holy cross is meant to be kept in this church. I don’t know latin but this clay sculpture of Christ being carried after crucifixion seemed very lifelike after nearly 400 years. Not directly related to the church, but we also noticed a number of posters highlighting an event held every last Sunday in July since 1644. 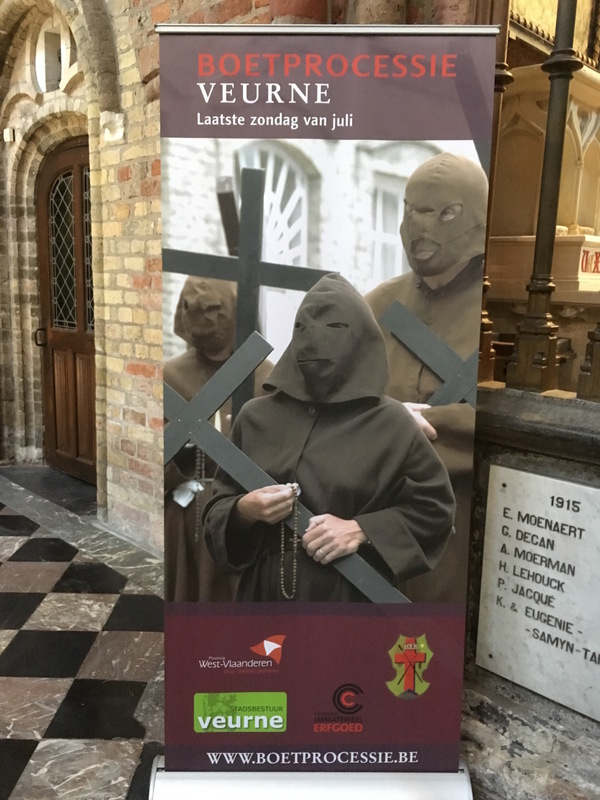 This is a large festival focussed on ‘The March of the Penitents‘ or ‘Boetprocessie’ in Flemish. Poster for the March of the Penitents. 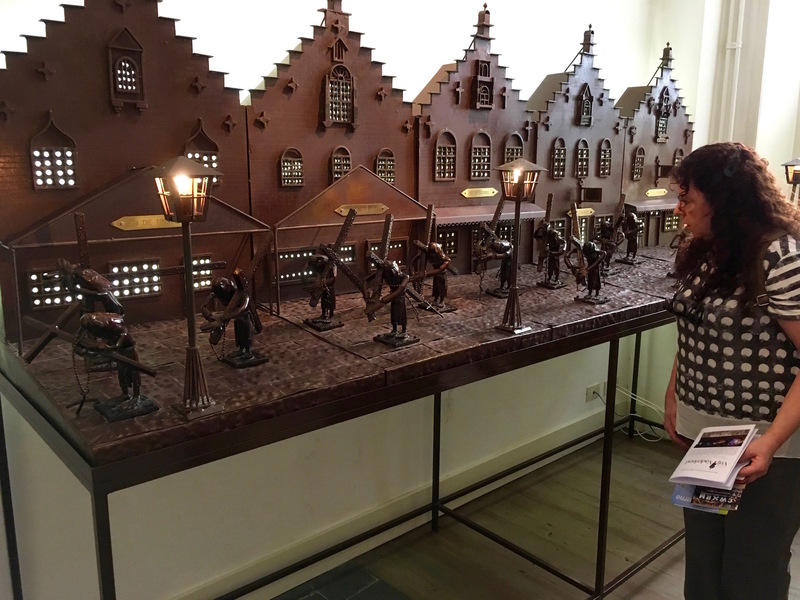 A model of the March of the Penitents, held in the Stadhuis. There used to be a number of these marches held in Belgium but only the one in Veurne still continues. A procession of people who have applied to the religious order the ‘Sodality’ carry heavy wooden crosses along a fixed path through the town. Some are one-timers, others are regulars each year. The intention is to provide the marchers with an opportunity for reflection, contemplation and hard work in order to satisfy a need for some spiritual expression. It is a great shame we will not be around to witness this impressive event. After only a little while longer enjoying the warmth of the sun, strolling through the gardens, Ian returned to the boat for his date with Tony, while Lisette followed back more slowly. The Grote Markt in Veurne showing the Stadhuis (town hall), the Landhuis (manor house) , St Walburga church and the Belfry. 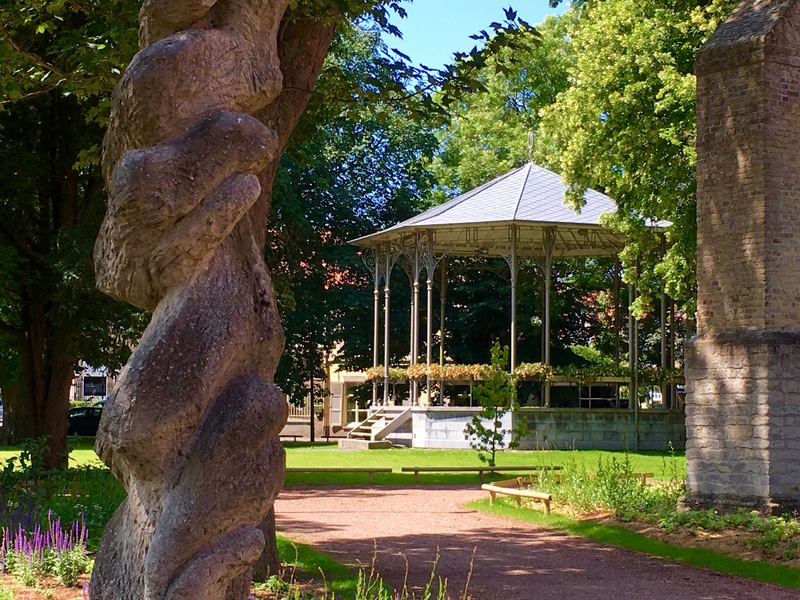 The latter dates from 1628 and is one of 23 in Flanders that were World Heritage listed in 1999. A pretty rotunda just behind the Grote Markt. Our water is heated by a ‘flash’ system whereby a smallish water reservoir is heated by a diesel furnace. It usually works unattended and we tend to switch it on first thing in the morning for showers, off again for the day and on again if we need to heat water for dishes. Tony approached the water heater problem methodically and started with examining the fuel delivery system. The first filter in the system is a water trap, a canister that collects any condensation and needs to be periodically drained. Ian hadn’t done this last year (and who knows when was the last time) and water gushed and gushed out. We disassembled the filter and the metal filter was covered with a thick mass of brown goop. Diesel bug! Modern diesel frequently has biological oils added and when water gets into it, microorganisms grow in it. Additives can help prevent this but eventually they will grow. So here looked to be the problem. We cleaned the filter thoroughly and reassembled it but still no sustained flame in the heater. Tony then disassembled and cleaned a complicated looking air filter closer to the heater and when we put this back, success – the heater fired and burned continuously. It’s a feature of the ‘extended village’ that constitutes the barging community that we are reliant on the skills of others sharing our problems and solutions amongst ourselves for the common good. However, we were very lucky to have Unique show up with that set of skills on our second day! We now had water AND a way of heating it. After dinner we went across to Unique for this evening’s drinking session. Tony and Heidi were heading off the following morning to have Unique pulled out of the water for a repaint and anode check. Ian went off the pick up the hire car while Lisette got a few more chores done and some washing. On his return we drove to Ghent (about an hour from Veurne) to pick up some filters and odds and ends from one of the larger chandleries (stores dedicated to shipping items). Back locally, we managed to find even more things to buy at Delva – hardware heaven (and why not pick up some more substantial items while you have a car) – all ready to leave for Briare Le Canal and the DBA Barge Rally the following (Wednesday) morning. It had been a busy few days but we were confident that Catharina was ready to cruise off as soon as we arrived back from Briare. Thanks for your very interesting account. I love those figurines you both did. Such a wonderful idea and a worthy activity indeed. It’s great that you have instant friendships created in your barging community. I find it is the same with motorcycling. Hi Rob, they are certainly a great bunch but you are correct, groups like bargees and bikers, with a strong shared interest, do make for a strong community. Where’d that “like” button go? You are absolutely right about the helpfulness and skill set of the extended barge community. Yeah, it’s annoying me I don’t have it. Must be a setting somewhere. Will sort it out. We hope you and Becky are enjoying some cruising – wonderful to catch you at Briare. Glad to hear you arrived safe and well. The concept of the figurines is fantastic and moving. Enjoy your warm showers. Thanks Julie, its become so warm (low 30’s) that a cold shower would be no problem just at the moment. Been loving your photos of Vanuatu and looking forward to hearing the stories that go with them.